What are stock market indexes? The over-all movement of stock markets can be simulated by constructing an index of that market. The oldest and most famous index of the U.S. stock market is the Dow Jones Industrial Average (DJIA). The DJIA is composed of 30 large companies. The 30 companies are selected by personnel at Dow Jones. From time to time companies are replaced with other companies. When the DJIA was first created, the stock price of all 30 companies was added together and divided by 30. This simple formula has become more complex over the years as stock splits, mergers, and other activities have complicated the formula. A broader measure of the U.S. stock market is the S&P 500. The 500 companies are selected by the Standard & Poors Corporation. They are not the 500 largest companies in the U.S. stock market. The index is designed to simulate many different sectors of the U.S. economy. The index is composed of roughly 400 industrial, 40 utility, 40 financial, and 20 transportation stocks. The value of the S&P 500 represents about 80% of the total value of all companies in the U.S.
One of the broadest measures of the U.S. stock market is the Wilshire 5,000. In 1971, when this index first started, it included all of the 5,000 companies headquartered in the United States. Now the index includes the over 7,000 companies headquartered in the United States. This index represents almost 100% of the total market value of all companies in the United States. A common stock index fund is a mutual fund that attempts to mirror the performance of an index. If the mutual fund is large enough and has enough assets, it can literally buy shares of every company included in the index it is tracking. If the mutual fund does not have enough assets to buy stock of every company in the index it is tracking, it may purchase stock in the companies that make up the majority of the market value of the index being tracked. The goal of an index fund is to have the same return each year as the index it is tracking. What indexes do index funds usually mirror? Index funds usually do not mirror the Dow Jones Industrial Average. Because this index is made up of only 30 large companies, it is generally considered to be too narrow of an indicator for the whole U.S. stock market. The most popular index for index funds is the S&P 500. The overwhelming majority of money invested in index mutual funds is invested in index funds that attempt to mirror the S&P 500 index. The S&P 500 is a good proxy of the whole U.S. stock market because it constitutes over 80% of the value of the whole U.S. market. The Wilshire 5,000 is also used by some index funds. It can be argued the Wilshire 5,000 should be the index used by index mutual funds because it represents almost 100% of the market value of the whole U.S. market. Why do people use index funds? Many studies have shown that index funds provide a higher return than regular common stock mutual funds. Over the decade of the 1990's, index funds gave returns to their investors better than 80% of the regular common stock mutual funds. Why can't professional managers beat the results of index funds? Index funds have an inherent cost advantage over regular common stock mutual funds. Regular common stock mutual funds must hire a professional manager to decide which stocks to buy and sell. A professional manager can cost anywhere from $100,000 a year to over $1 million a year. An index fund simply buys all the stocks in the index. Since an index fund does not need high priced professional managers to decide what stocks to buy and sell, they avoid the high management fees. Regular common stock mutual funds have to incur the cost of research to determine which stocks to buy and sell. Many professionally managed funds have full time researchers to suggest to the professional manager which stocks to buy and sell. Some professionally managed funds pay outside research companies to do this research. Since an indexed fund simply buys all the stocks in the index, it does not have to do any research on what stocks to buy and sell. Regular common stock mutual funds also have to incur the cost of brokerage fees incurred whenever stocks are bought or sold. Professional fund managers buy and sell anywhere from 10% to over 100% of the common stocks in their portfolio each year. The average common stock mutual fund manager buys and sells 80% of the common stocks in the mutual fund each year. Every time the professional manager decides to buy or sell a stock in the hopes of improving the fund's return to its investors, the fund incurs brokerage fees. An index fund only buys and sells stocks when investors add money to the fund, or they want to redeem their shares in the fund. Therefore, an index fund incurs a relatively small amount of brokerage fees. The three examples above illustrate some of the additional costs a professionally managed common stock mutual fund must incur compared to an index fund. The professionally managed fund must annually charge its investors anywhere from 1% to 3% of the money the investor has invested in the fund. The over-all annual expense fee for regular common stock mutual funds is 1.44%. An indexed fund typically charges 0.2% to 1% of the investor's assets. A professionally managed fund must not only buy/sell the right stocks to equal the return of the index being tracked, it must also do better than the index so after fund expense fees the investor nets the same return as the index. This has proven to be a very formidable task for professional fund managers. Are there any disadvantages to index funds? If you invest in an index fund, you are assured of getting the same return as the index you are tracking. Index funds usually track their index within 1%. Index funds usually have a return slightly lower than the index they are tracking because of expense fees and some necessary inefficiencies like keeping some assets in cash for redemptions. Some investors feel they can research, select, and monitor professional common stock mutual fund managers who can beat the market indexes. These investors would argue that if you invest in index funds, your returns will never be higher than the index being tracked. Believers in index funds would argue the odds are so low of finding a professional manager that can equal the index year after year, why even try finding one. Some investors feel they can identify sectors of the economy that will outperform the general market indexes. These investors would reject index funds in favor of common stock mutual funds targeted towards the sector they feel will outperform the market. Believers in index funds would argue the odds are so low of predicting winning sectors year after year it is not worth the effort. Can index fund performance be guaranteed? Index funds mirror the index they are designed to track. If the index being tracked loses money in a particular year, your index fund will lose about the same amount of money. Since index funds invest in stocks, and the value of stocks fluctuates up and down, your index fund holdings will fluctuate up and down with the index. How closely do index funds track their indexes? Index funds track their index relatively well. Vanguard's fund indexed to the S&P 500 has been in existence since 1976. A review of this fund's performance since 1976 shows the fund's return is generally within 1% of the S&P 500. How popular are index funds? On April 5th, 2000, the Vanguard Index Trust-500 Portfolio fund surpassed the Fidelity Magellan fund to become the largest mutual fund in the world. The popularity of index funds is demonstrated by the fact the Vanguard Index Trust-500 fund continues to be one of the biggest mutual funds in the world. How much money is invested in index funds? According to the Investment Company Institute, less than 10% of all money invested in common stock mutual funds is invested in indexed funds. Since 1995, each year has seen a steady increase in the per cent of new money going into index funds versus regular common stock mutual funds. In 1998, according to Financial Research Corporation, 19% of all new money flowing into common stock mutual funds flowed into index funds. In 1999, the Financial Research Corporation estimated 40% of all new money flowing into common stock mutual funds went into index funds. Indexing is very popular with professional pension managers. According to John Bogle, these pension managers invest 20% of their stock investments using an index fund approach. How much time do I have to spend monitoring index funds? One of the reasons index funds are popular is that they take very little time to monitor. Many investors want to achieve a good return on their investments, but are not interested in spending a lot of time on investing. Index funds are a perfect match for people who want to assure they will do as well as the general stock market, but have no interest in spending a lot of time on investing. Many investors enjoy spending time monitoring their professionally managed funds. They constantly monitor their professionally managed funds to make sure fund performance is not slipping, their manager has not left the fund, or the fund has changed its investment style and they don't agree with that new style. These types of investors probably prefer professionally managed funds versus index funds. Are there index funds for foreign stock markets? The firm of Morgan-Stanley tracks the value of all stock markets in the world. According to Morgan-Stanley, as of 3/31/02, the U.S. stock market represents about 58% of the world's stock market value, the European stock market is 26%, the Pacific stock market is 10%, and the remaining 6% is emerging markets or other. Check Morgan-Stanley's web site for updated data on how the world's stock markets are divided since the percentages change each year due to changes in relative values of world markets. Many studies have shown that investing in stock markets outside of your home country has the potential to lower the over-all risk of your stock portfolio and increase your returns. Owning stocks from other countries adds diversification to your stock portfolio because the stock markets of some countries may be going up in value while other countries may be seeing their stock markets decline in value. Investing in the stocks of other countries adds some new types of risks as compared to only investing in the stocks of your home country. Currency exchange rates between countries vary daily. It is possible to own stocks in a foreign country that rise in value, but give you a net loss on your investment (as measured in your own local currency) because the currency exchange rates moved in the wrong direction. Investing in foreign stock also involves political risk. Many countries have varying degrees of stable governments. If you own stock in a country and the government of that country collapses, it could have an adverse affect on the value of your stocks. Investing in foreign stocks also involves higher transaction costs. It usually costs U.S. investors more money to buy and sell foreign stocks than U.S. stocks. As an example, some people argue that a true believer in indexing would invest 42% of their stock portfolio in the U.S., 26% in Europe, 10% in the Pacific, and 6% in emerging markets because this is the way the world's stock markets were divided on a particular date. Because of the added currency risk, political risks, and higher transaction costs, many U.S. investors choose to diversify their portfolio by investing 10% to 20% of their stock portfolio in foreign markets. Investors need to be aware of currency risks, political risks, and transaction costs when they decide what portion of their stock portfolio to allocate to the stock markets of countries foreign to them. Vanguard offers index funds that invest in several foreign markets including Europe and the Pacific. The Vanguard funds usually track the Morgan-Stanley Capital Investment (MSCI) index for the foreign stock market being tracked. Can I mix index fund investing with active portfolio investment? Many investors believe in the concept of index funds, but believe it is worth trying to find professionally managed common stock mutual funds that can beat the market indexes. Other investors believe in the concept of index funds, but want to experiment and see if they can choose common stocks themselves and beat the market indexes. A good compromise for these types of investors is to establish a core holding in common stock index funds. For example, an investor could put 80% of their stock portfolio allocation into a fund indexed to the Wilshire 5,000. The investor could take the remaining 20% and experiment with finding exceptional professionally managed mutual funds, or pick some common stocks themselves. If the investor is successful picking funds or stocks that consistently beat the market indexes, they can shift some of their money out of index funds and into professionally managed funds or common stocks. If the investor is not successful picking exceptional professionally managed funds or common stocks, they can shift more money into the index funds. Are there any fund families that stand out as leaders in index funds? Vanguard stands out as a leader in index funds. They pioneered the introduction of index funds by offering the first publicly available common stock index fund in 1976. They have led the market in index funds by introducing funds indexed to the S&P 500, Wilshire 5,000, European stock market, and the Pacific stock market. Vanguard's Index Trust-500 Portfolio fund will probably continue to be one of the largest stock mutual funds in the world. Vanguard's popularity has been caused in great deal by their ability to offer the lowest annual expense fees of any mutual fund. Vanguard's Index Trust-500 Portfolio fund only charges its investors 0.2% a year in fees. What are the index funds offered by the American Stock Exchange? During the 1990's, the American Stock Exchange began to offer new products which compete directly with conventional index funds managed by mutual fund companies. In 1993, SPDR's (pronounced "spiders") were introduced. SPDR's are Standard & Poors Depository Receipts. This product is designed to track the S&P 500 index. New SPDR shares are priced to trade at one-tenth the price of the S&P 500. If you buy a SPDR share when the S&P 500 is at 1120, it should be priced at about $112. SPDR's are the most popular of the AMEX index products with over $13 billion in assets as of 1999. SPDR's must be bought and sold with a discount or full service broker. The AMEX ticker symbol for SPDR's is SPY. In 1998, the American Stock Exchange introduced a new product called Diamonds designed to track the Dow Jones Industrial Average. The Dow Jones & Company, Inc. licensed AMEX to use the DJIA benchmark for Diamonds. The AMEX ticker symbol for Diamonds is DIA. Diamonds are initially priced at 1/100th the value of the Dow. If the Dow is trading at 9,000, Diamonds would be priced at $90. There is about $500 million invested in Diamonds as of early 1999. In 1999, AMEX introduced QQQ's. This product is designed to track the NASDAQ 100 index. The AMEX ticker symbol is QQQ. QQQ's are initially priced at 1/20th the value of the NASDAQ 100. If the NASDAQ 100 is trading at 2200, a share of the NASDAQ 100 trust would cost $110. Introduced in March 1999, investors quickly invested more than $1 billion in this product. This product only tracks 100 of the 5,000+ stocks that make up the entire NASDAQ market. AMEX offers more index products including MidCap SPDR's based on the S&P's MidCap 400 Index, Select Sector SPDR Funds based on 9 specific industry sectors composed of shares of companies in the S&P 500, and WEBS (World Equity Benchmark Shares) on 17 different foreign countries based on Morgan Stanley Capital International (MSCI) Indexes). See AMEX's web site at www.amex.com for more information and to get a prospectus on their index products. What are the pros and cons of conventional index funds compared to the American Stock Exchange index fund products for long term investors? Believers in index fund investing would recommend investing in indexes which mirror the entire stock market. The S&P 500 and Wilshire 5,000 indexes meet this criteria since they represent 80% or more of the U.S. stock market value. The Dow Jones Industrial Average does not meet this criteria because it only represents 30 stocks. Of the AMEX index fund products, only SPDR's meet this criteria since they track the S&P 500. Diamonds and QQQ's do not meet this criteria since they are not broad enough measures of the U.S. stock market. AMEX index funds let you buy or sell at the current price during the day. With conventional index funds, you buy or sell at the end of the day price. This difference should not concern long term investors since they do not trade in and out of funds on a short term basis. Conventional index funds can be purchased from a no-load mutual fund company with no fee to purchase and no fee to sell shares. Investors who purchase AMEX index fund products must pay a discount or full service broker to buy or sell shares of these products. Because of these brokerage fees, if you invest small amounts each month, you may prefer a conventional no-load index fund instead of the AMEX index funds. Annual expense ratios of AMEX index fund products appear to be very close to conventional index funds. Conventional index funds offer automatic dividend and capital gain reinvestment. The AMEX funds may or not offer automatic dividend and capital gain reinvestment depending on the policies of your broker. AMEX funds do not offer automatic investing plans (automatic monthly investing from your bank account) and most conventional index funds do offer this service. Most conventional index funds also offer an automatic withdrawal service in which you receive a fixed amount each month. Investors should obtain and carefully study the prospectus and determine which product best suits their needs. Apparently investors favor conventional mutual funds if you make the observation Vanguard's Index 500 had $79 billion in assets in early 1999 compared to only $13 billion invested in SPDR's. What are ETF's (Exchange Traded Funds)? ETF's is a generic phrase coined around the year 2000 for any type of stock exchange traded index type instrument. SPDR's, QQQ's, and Diamonds can all be classified as ETF's since they are traded on stock exchanges. ETF's are not traditional mutual funds offered by mutual fund companies. ETF's typically have the same features as the AMEX traded index products explained above. Barclays now offers Ishares and Vanguard is beginning to offer Vipers as additional choices of ETF's. I have heard that stock index funds have a great deal of unrealized capital gains. With the aging of the Baby Boom Generation, index fund redemptions will force the index fund manager to make massive stock sales which will trigger unwanted capital gains for shareholders of the index fund. Is this a valid reason to avoid index funds and choose ETFs or individual stocks instead? Although this scenario is possible, it would take preposterously large redemptions to create a big tax bill. This criticism is often pointed specifically at a group of very large and very old index funds, such as Vanguard Index 500. In fact, Vanguard has run simulations of large redemption scenarios and estimates that they can handle losing 10% of assets in a short period of time without making any capital gains distributions. A sudden net-redemption of 10% of assets would be very unusual for any mutual fund. Furthermore, if the redemptions occurred during a market downturn, fund manager Gary Sauter claims that Vanguard could handle losing 40% of assets without making capital gains distributions. Since the Vanguard 500 is the oldest index fund, it is safe to say that other index funds could theoretically handle at least a similar level of redemptions. Almost all stock index funds are market capitalization (number of outstanding shares times the market price) weighted meaning the index fund invests more money in larger companies and less money in smaller companies. Are there any stock index funds or ETFs that use equal weighting versus market capitalization and do they perform better than traditional index funds? Rydex S&P Equal Weight (symbol RSP) is an ETF introduced in April 2003 which uses the equal weighting versus the market capitalization approach. The performance of this equal weighted fund versus the S&P 500 is shown to the right. Since the Rydex fund has been in existence for a relatively short time, it is difficult to predict based upon past performance whether this fund will give returns higher than a conventional index fund. Relative performance of this equal weighted fund to the S&P in future years will probably depend on the popularity of large companies. As larger companies become popular investments, the S&P will probably outperform the Rydex fund. 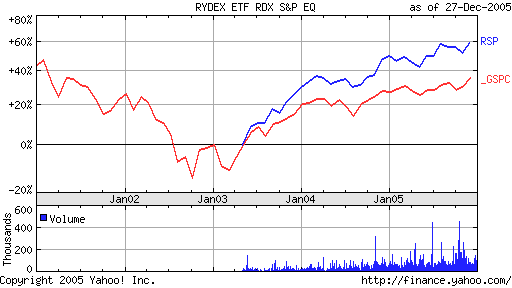 As larger companies become less popular, the Rydex fund may outperform the S&P. In theory, equally weighted index funds avoid the problem of certain industry sectors becoming too popular and skewing the averages of market capitalization weighted indexes. In the late 1990ï¿½s, technology stocks became an inordinately large portion of the traditional S&P 500 fund because of their high stock prices. Once the boom ended, the traditional S&P 500 funds declined excessively as the value of technology stocks fell. What are the historical returns of the S&P 500? Who is Warren Buffett and what did he say about investing in index funds? Warren Buffett is one of the two richest men in the world. He and Bill Gates (of Microsoft fame) take turns in different years being the richest men in the world. Buffett will probably go down in history as the greatest investor of all time. In 1997, Buffett was quoted as saying ï¿½Most investors, both institutional and individual, will find that the best way to own common stocks is through an index fund that charges minimal feesï¿½. Who is Charles Schwab and what did he say about investing in index funds? Charles Schwab is founder of The Charles Schwab Corporation, a large financial services company. In his book, Guide to Financial Independence, he says "Most of the mutual fund investments I have are index funds, approximately 75%." What are "closet index funds"? Closet index funds are actively managed stock mutual funds that have stock portfolios which give similar results to conventional index funds before expenses and fees are subtracted from the annual return. Fidelity Magellan fund is often called a closet index fund because its results track very closely to the S&P 500. One way to determine if an actively managed stock fund is really a closet index fund is to determine the R2 between the actively managed fund and the index it is judged against. R2 is a statistical measure of how well changes in one variable track the changes in another variable. You can find R2 data for actively managed funds at Morningstarï¿½s web site. Only 5 to 10% of individual's stock market mutual fund investments are in index funds in the U.S. Why don't more people use passively managed index funds versus actively managed mutual funds? There are several possible explanations as to why more U.S. investors don't use index funds. One of the most important reasons is lack of education in the U.S. on investing. Unless a person takes a college finance class, it is very unlikely you will encounter any classes in investing in grade school or high school. It is interesting to note that pension fund managers (who we assume are relatively well educated in investing) choose to index 20% of their money as opposed to the 5% to 10% rate of individual investors. Another major factor is the business model of most financial advisors in the United States. Most financial advisors are commission based, meaning they receive a portion of the money invested in the asset they sell the investor. There is much more money to be made by the advisor in selling load actively managed mutual funds versus no-load index funds. A third major factor is the business model of the popular media in the United States. Television shows (like CNBC) and financial planning magazines (like Money, Kiplingers, and SmartMoney) make their money by selling advertising. If markets are efficient and index fund investing is the best way for most investors to invest in the stock market, there is no need for CNBC. Likewise, it is doubtful the financial planning magazines would sell many magazines since their only story would be about index funds. A fourth major factor is the business model of the mutual fund companies in the United States. All of the mutual fund companies (except Vanguard) are driven to maximize profits for their shareholders. The way they choose to maximize profits is to promote actively managed mutual funds and make money from the fees they charge investors. These fees currently average 1.44%. Vanguard is owned by its investors, not by shareholders. Vanguard is driven to reduce its expenses so their investors maximize their return. This explains why you can buy passively managed index funds from Vanguard with expense ratios of 0.2% compared to the 1.44% industry average. The fifth major factor is probably related to human nature. A relatively new field, called behavioural finance, has been conducting research to determine whether people are really rational investors. Some key findings in this field include the fact that investors thing they are more competent at investing than they really are. This overconfidence leads them to believe they can find investments that beat the market averages. Another finding is that people believe their successful investments are due to their prowess as investors, but poor performing investments are not their fault. As more research is conducted, more explanations will probably be found that explain why people cling to actively managed investing even though the historical data supports passive investing in index funds. See the link below for more research on behavioural finance. How important are re-invested dividends when reviewing the returns of various stock market indices? U.S. stocks average about 1.5% dividend payout each year. If you are comparing the return of your actively managed fund or passively managed index fund to a stock market index, it is important to make accurate comparisons. For example, if the return of your actively managed fund or your passively managed index fund includes reinvested dividends, you should compare them to a stock market index which includes re-investment of dividends. It is often difficult to tell if the market index includes or does not include re-investment of dividends. If you visit the web site of the firm which maintains the market index (Standard & Poors for the S&P 500, Wilshire Associates for the Wilshire 5,000, Frank Russell Company for the Russell 3,000, etc), you can usually find the annual return of the market index with and without re-investment of dividends. Many investment advisors recommend that U.S. investors increase their asset allocation to non-U.S. investments. What can I do if there are no ETF's or index funds available which invest in the country I want to invest in? There are closed-end mutual funds which are very similar to conventional open-end index funds which invest in other countries. A closed-end mutual fund is a fund with a fixed number of shares outstanding, and one which does not redeem shares the way a typical mutual fund does. Closed-end funds behave more like stock than open-end funds: closed-end funds issue a fixed number of shares to the public in an initial public offering, after which time shares in the fund are bought and sold on a stock exchange, and they are not obligated to issue new shares or redeem outstanding shares as open-end funds are. The price of a share in a closed-end fund is determined entirely by market demand, so shares can either trade below their net asset value ("at a discount") or above it ("at a premium"). A closed-end fund is also called a closed-end investment company or a publicly-traded fund. Examples of closed-end mutual funds are PGJ, which invests in China, and EWZ, which invests in Brazil. You should check out the expense ratios of these closed-end mutual funds. For example, PGJ has an expense ratio of 0.70% and EWZ has an expense ratio of 0.74%. What is asset allocation and what role do index funds play in asset allocation? Asset allocation is the process of dividing investments among different kinds of assets, such as stocks, bonds, real estate, and cash, to optimize the risk/reward tradeoff based on an individual's specific situation and goals. In 1986, Gary Brinson published in the Financial Analysts Journal his famous paper on asset allocation titled Determinants of Portfolio Performance. Brinson found that asset allocation, not the specific stocks in a portfolio, were the key determinant in the return of the portfolio. Brinson found that asset allocation explained over 90% of a portfolio's return. His findings were subsequently confirmed by other researchers (Ibbotson and Kaplan, 2000; The Vanguard Group, 2003). One method of using asset allocation is to first determine what percent of your portfolio should be invested in stocks, bonds, real estate, and cash. Index mutual funds, or ETF's can then be used as a very low cost way to invest your portfolio in stocks, bonds, or real estate. See The Coffeehouse Investor below as one example of how to use index funds to achieve the asset allocation which fits your goals and risk levels. Also see The Bogleheads Guide to Investing below for additional information on asset allocation. What are life-cycle funds and how can index funds be used within them? Asset allocations should be adjusted at least annually through an investor's lifetime. Annual adjustments are required for several reasons. Adjustments should be made to keep the various types of assets in their proper allocation as the value of each asset type changes each year. As the investor ages, there should be a gradual shift from higher risk stock assets to lower risk bond and cash assets. Many investors do not want to be burdened with adjusting and changing their asset allocation every year. For these types of investors, life-cycle funds may be appropriate. A life-cycle fund is a highly diversified mutual fund designed to remain appropriate for investors in terms of risk throughout a variety of life circumstances. Accordingly, lifecycle funds offer different risk profiles that investors can shift invested funds between in order to manage risk effectively as they move from youth to middle age to retirement. Although lifecycle funds all share the common goal of first growing and then later preserving principal, they can contain any mix of stocks, bonds, and cash. An investor simply picks a life-cycle fund that has a retirement date close to when the investor desires to retire and the life-cycle fund takes care of any annual adjustments required automatically. Life-cycle funds can use index funds for the various asset classes that make up the fund's asset allocation. Vanguard has life-cycle funds that use index funds for the various asset classes. What resources are available on the Internet for index fund information? I am new to investing. I don't know much about mutual funds, but I'm interested in the index fund approach. Are there any books that teach mutual funds and investing from an index fund approach? Book is targeted to new investors who want to learn investing using an index fund approach. Experienced investors can also quickly learn the basic concepts of index funds. Covers risk and returns, diversification, mutual funds, index funds, foreign index funds, and asset allocation. This book was designed to be read in 1 hour or less so readers can quickly and efficiently learn the basic principles of index fund investing. Book is targeted to new investors and experienced investors who want to increase their net worth but don't to spend all their valuable time on investing. Covers index funds and asset allocation. See web site above for examples of asset allocation using index funds. Three of the main contributor's to the Vanguard Diehard's web site noted above share their philosophy on investing using an index fund approach. Book covers index fund investing and asset allocation. I am an experienced mutual fund investor. What books are available on index funds? > A Random Walk Down Wall Street by Burton G. Malkiel. >Bogle on Mutual Funds by John C. Bogle. >Winning with Index Mutual Funds by Jerry Tweddell and Jack Pierce. This FAQ on Index Funds was prepared by Dale C. Maley, President of Artephius Publishing and Author of > Index Mutual Funds: How to Simplify Your Financial Life and Beat the Pro's.